What can mobile consumer sentiment and behaviors in one bustling market illuminate about global trends? 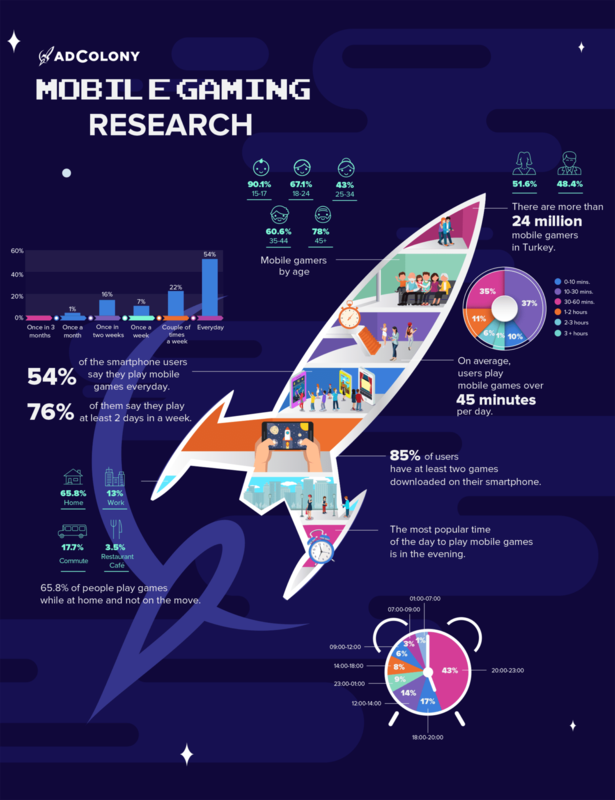 To find out, the AdColony team partnered with Nielsen to conduct a survey of mobile gamers and mobile gaming habits, and the results reaffirm the global trend across mobile: mobile gaming is a demographically diverse audience that continues to expand and grow. The survey revealed that this growing market for mobile shows no signs of stopping, and is a huge opportunity for developers, publishers, and advertisers alike. With respondents from 15 years old to 65, across different local demographics, the survey paints a rosy picture for the future of mobile gaming in Turkey. Like other surveys of mobile users worldwide, sentiment around IAP was low; Turkish gamers weren’t really keen on spending money on mobile games. 92.9% of Turkish respondents said they weren’t really interested in paying for extra lives, items, or in-game currency. However, the same barrier wasn’t as strong when in-game advertising was involved! When asked if they would watch ads to get more lives or in-game currencies, almost half of the participants responded positively. While users under 24 were slightly more apt to purchase IAP, Turkish gamers in the 55 and up demographic shows a huge inclination towards rewarded video — 66% would be willing trade 15 to 30 seconds of their time for in-game items. Regardless of sentiment, IAP continues to be a huge driver of revenue for mobile developers globally, at least for the time being. 90% of mobile gamers said they play games “mainly” on their smartphones, but tablet gaming sits at 33%. Turkish mobile gamers average 45 minutes a day playing. Check out the infographic for more great insights into Turkish mobile gamers below! A full-size graphic is also available. The original Turkish infographic is also available. You can also contact AdColony’s Turkey team to learn more! Nielsen is a global performance management company that provides a comprehensive understanding of what consumers Watch and Buy. Nielsen provides media and advertising clients with Total Audience measurement services across all devices where content — video, audio, and text — is consumed. Nielsen provides its clients with both world-class measurement as well as analytics that help improve performance. Nielsen, an S&P 500 company, has operations in over 100 countries that cover more than 90 percent of the world’s population. What do you have in common with Turkey’s mobile gamers? Is your region similar, or completely different? Tweet us at @AdColony. For the latest AdColony mobile news and updates, follow @AdColony on Twitter, like us on Facebook, or connect on Linkedin.